Libraries of Indiana State University, Rose-Hulman Institute of Technology and St. Mary-of-the-Woods College have joined forces with Vigo County Public Library to integrate their search systems and allow users to simultaneously search each of the library's holdings. The agreement creates the first academic and public consortium in Indiana and is only one of a handful in the United States. The three schools of higher education have shared an integrated library system for 11 years, but this marks the first public partner in the consortium. 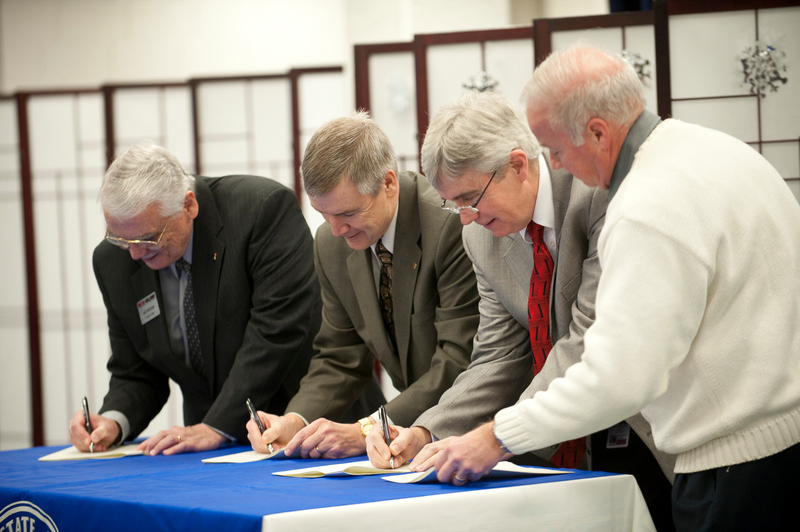 Signing the memorandum for the libraries Thursday morning were: Art Western, vice president at Rose Hulman; Gordon Afdahl, vice president at St. Mary's; William Bruce, chair of the Vigo County Library board; Robert English, associate vice president at Indiana State. The consortium allows each library to pool its resources to share an integrated library system. The system allows the library users to look for materials in all the libraries with a single search. The system also helps libraries manage their holdings. Ultimately, the directors of the libraries think the new system will benefit those who use the libraries. "There is a wonderful relationship amongst the four libraries," Indiana State Cunningham Memorial Library Dean Alberta Comer said. "This will mean a wonderful experience for our students and the public who use the libraries." Nancy Dowell, Vigo County library director, agreed. "We really sensed that this partnership can provide much better service to our patrons. We already share so many patrons with the three schools," she said. Judy Tribble, St. Mary's library director, said it make sense for all of the libraries to work together since they're in Vigo County. By doing so, the consortium also provides a cost savings for the county and the schools. "We all share the hardware, software and human resources of the system," she said. Partnering with the public library also offers easier access to greater materials. "They offer a different variety of information that we wouldn't purchase but in which our patrons would be interested," said Rachel Crowley, Rose-Hulman library director. "Anybody on the Internet can search the holdings." Indiana State signed a contract on Wednesday, Jan. 27, with Innovative Interfaces Inc., to provide the new integrated library system. The new system should be in place in August. "It will make the catalog more of a Google-like search environment," said Tim Gritten, chair of library systems. "It will offer spell check and ‘Did you mean this?'" The system also will incorporate photos, videos, and documents contained with Wabash Valley Visions and Voices. "It's a way to expand people's areas of interest and narrow topics faster," he said. "We want to get our patrons to what they need faster." A significant perk of the new system is that it is accessible through mobile devices and has the capability of generating RSS feeds. In addition, library users will have the option of searching an individual library catalog or performing a simultaneous search of all the catalogs. "We want to make this as flexible as possible," Gritten said. The new system should be a step forward for the students and public searching for information, said Paul Asay, library systems programmer. "The real goal is to make students lives very simple," he said. The agreement between libraries at Indiana State, St. Mary's, Rose-Hulman and Vigo County Public Library creates the first academic and public consortium in Indiana and is only one of a handful in the United States.